* Make the most of your seed. know-how needed for success is detailed below. This page outlines the proper use of trays, modules, and propagators and other aids to help you get better results when raising plants from seeds. 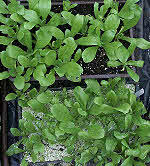 Methods for sowing seed directly outdoors are described on my vegetable seed and later on lawn seed. 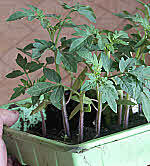 Organic Gardening Advantages To Starting Seeds In Propagators, Trays, Pots And Modules. You'll grow a wider variety of plants by controlling warmth, moisture and light. Seed starting methods with propagators and modules are especially useful when transplanting into containers and hanging-baskets. And with more expensive F1 hybrid seed for your ornamentals, you really won't want to waste them on less certain methods in the open garden. Suitable compost is important for success. 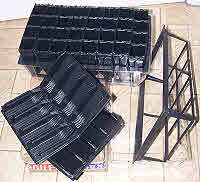 Use Seed Trays to Raise Large Numbers of Plants from Small Seeds and Prick Out into Pots. You might finish with one sprinkle from a fine rose watering-can or misting. But note that heavy watering can displace small seeds leaving them exposed, swamped or crowded. Compensate for drying out by bottom watering and use a perspex cover to maintain humidity - You'll find propagators for maintaining moisture, ventilation and warmth outlined below. For smaller numbers of high value plants - fruit, vegetable, and expensive F1 hybrid flowers - modules are better used for raising your plants. Modules avoid the extensive root disturbance that accompanies pricking out from trays. Seeds that are big enough to handle individually - anything from the size of tomato or sweet pepper seed and larger - are well-grown individually in modules. These seeds give high germination rates in properly prepared compost and I sow one per module. Although cucumbers, melons - being less reliable may be sown 2 per module - nevertheless, I sow expensive F1 hybrid seed into individual modules. Bigger modules are used for long-stay plants such as those sown in the fall to overwinter. A larger compost volume feeds the plants and better protects the roots over this extended period. For example: onion seedlings left to overwinter will be at risk in small shallow modules. Larger plants such as melons, cucumbers, and marrow, should be given every opportunity to grow a strong root system unchecked. root disturbance & plant stress. Transplanting these cauliflowers is easy to do. You can grow a well-branched fine root system with help from Rootrainers™ (Root Trainers). Their ridged design air-prunes roots and stimulates branching. This reduces the length of old root and prevents them circling the outside as is typical in ordinary pots. Root trainer modules are deeper than wide, helping to ensure transplants are deeply rooted. While ordinary pots require tapping out, these modules open like a book. You'll be able to observe fine roots running up as well as down. You'll know when your plants are ready to go out. And then it's much easier for you to remove plant plugs without disturbance. Note: whatever modules or pots you use, always soak plugs before transplanting. Give your seeds the minimum temperature in-spite of the cold. Early plants have longer to develop and some flowers can be brought to flower in one year instead of two. Many plants can be made to bloom or crop for longer. Maintain the right amount of water for germination and then for growth. When soil dries, growing roots are harmed. Too damp and plants may rot. Maintain sufficient ventilation but protect plants from drafts. Don't rely on the poor window light at the short ends of the season. Light is essential to maintain straight-up plants and avoid week elongated stems. For the best results you need a stable controlled environment around your seeds and seedlings. Sudden drops in temperature, or lack of moisture for example, will shock your plants and stunt growth. You'll find the equipment you need below. Heat mats save you heating the whole place. Most importantly, heat mats provide an even controlled temperature to save shocking plants during cold snaps. And this helps control disease by promoting healthy active root growth. You can advance sowing dates by raising the minimum soil temperature. Overcast days simply don't produce enough window light for seedlings. Although it's warmer indoors your plants become drawn with long thin stems that are yellowed and rather weak. But here's an alternative to heating a greenhouse. Take advantage of any warm room by adding an indoor horticultural lighting system. As your plants release oxygen in the light, and humidify the air, you could say they give you shelves of living ornaments for good atmosphere and health not to mention the fragrance that some live plants release. Get more light here. Make an early start with the APS propagator. You can give up to 40 young plants a great start with the APS40 kit. Built-in self-watering design means no fuss, plus replacement parts available on this link. Transplant pots with tray includes a water reservoir and capillary matting to help ensure that your seedlings don't wilt. For longer stay plants and no worries when you go away. 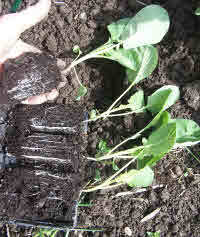 Larger Deeper Rooting 3" Seed starting modules on this link are good to grow high-value or long-stay plants from seed. Choose a good fine seed compost like the germinating mix on this link. Rootrainers™ (Root Trainers) - for starting seeds or cuttings, to make fine branching roots, and plugs that transplant easily without disturbance. Gentle warmth makes good growth without heating the whole space. Heat mats are available on all the above links or alternatively on this link. These grow lights brighten a warm room to make sturdy plants and enhance your decor. You can use them to breath some oxygen into your room. Here's a well-designed propagator with pop-up cells. You can give up to 49 young plants a great start from seed. Versatile multi-purpose features and built-in self-watering means no fuss, available on this link. Fyba Grow Tubes are here for growing beans. here's a self-watering propagator with 7 seperate trays. To get heat demanding flowers and fruit off to an earlier start use heated propagators like those on this link. You'll also find seperate heat mats and trays available on this link. EVEN EARLIER - These grow lights make sturdy plants and enhance your home decor. You can use them to breath some oxygen into your room. Choose a good fine seed compost. Most gardeners don't need huge bags for seed sowing and on this link they come in smaller sized bags.